Color matching is fun and a great way to teach kids about color names and how to discriminate between colors. We love doing activities with bunny mallows and Spring mix M&Ms. 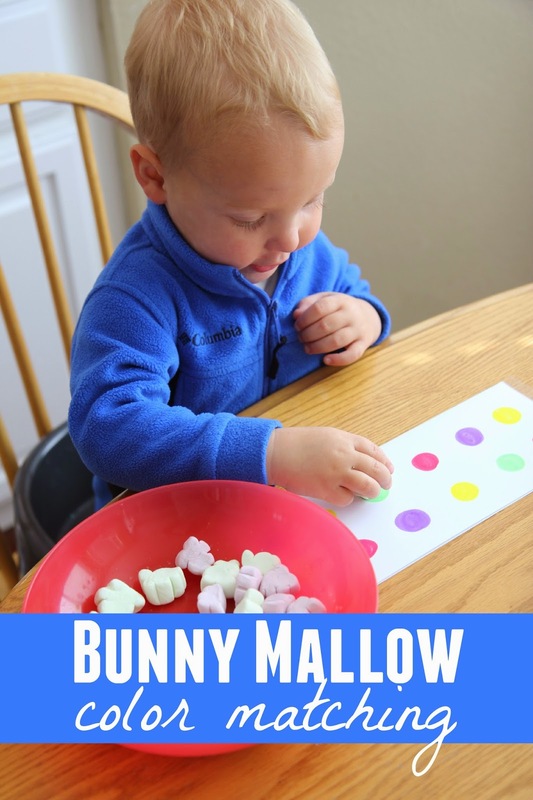 Today we're going to share a super simple color matching activity we did earlier this week using bunny mallows (bunny marshmallows). To Prep ahead just drawing a pattern on the piece of paper using the pastel markers. Then, give your child a bowl of bunny mallows and tell them to get matching! While your child is matching you can talk about the colors they are using. "Cool, you just put a purple bunny on the purple circle." "Can you find the green bunnies?" The point of the activity is to sit down and do it alongside your child and make it fun. Before we got started I alerted my 2-year-old that as part of our game we got to eat some marshmallows. First we had to match a few and then he could eat some. My son loved eating the marshmallows and making them hop along and go on bunny adventures. It was too cute. After we covered the entire pattern with marshmallows then we got to eat 1-2 and then we started over again! Are you going to do any bunny crafts or activities for Easter? Here are 9 more bunny crafts and activities to try!